Not a photo of my kitchen, or even really related to this post, just gorgeous kitchen eye-candy from Phoebe Howard. 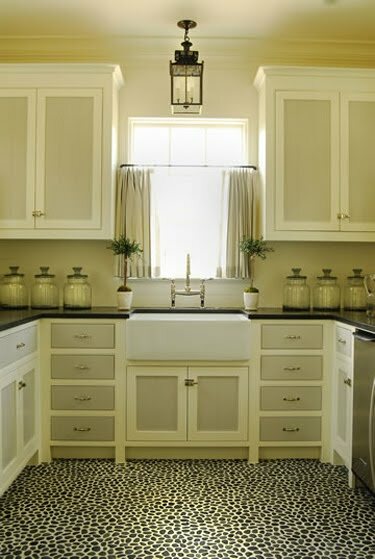 Back when we lived in our second house and were planning our kitchen remodel (read about it here & here), I researched all over the place, trying to find a good way to spruce up our white laminate cabinets. I could not find a single good how-to, and we soon decided we were going to move anyways, so we left them as-is to save money. * Remove doors and hardware. Caulk cracks. Wipe down the surface with lacquer thinner. Remove gloss with 220-grit sandpaper. *Position doors on a flat surface protected by something soft. *Brush on XIM, an alkyd primer and bonder (ximbonder.com), in a well-ventilated area. Let dry 24 hours. *Lightly sand all surfaces again. Brush on or spray two finish coats of semigloss enamel paint. Allow paint to dry for two days before installation. Avoid using cabinets for at least a week. And there you have it. Hope for uggo cabinets.